One search that brings people to our website almost more than any others is parents wondering how much is adequate protein for kids and what the best sources are. 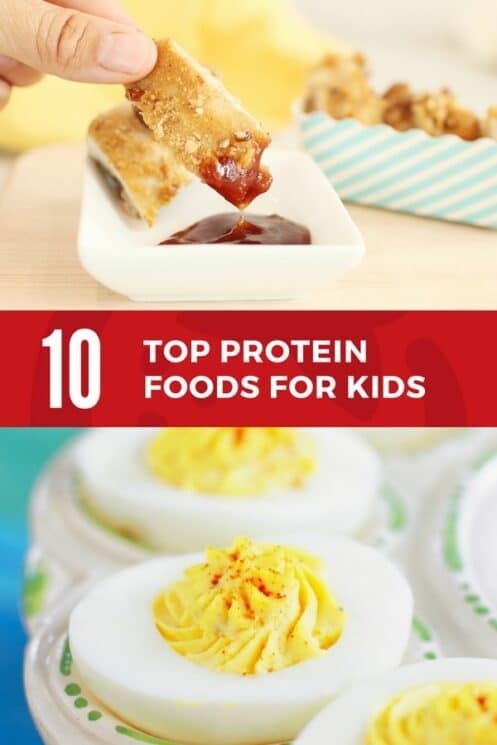 So, we’ve gathered our top 10 favorite protein for kids food ideas here! How much protein should kids eat? 2-4 ounces of meat or beans per day. Eggs: My kids love eating Easter Eggs all year. Coloring eggs doesn’t have to be limited to springtime! Why not add a few drops of color to your boiling water any time you boil eggs and have colored eggs anytime of year? Nuts: We’ll eat nuts any way we can get them, but we particularly enjoy trail mix or roasting nuts with some cinnamon or sugar. Using peanut butter in our smoothies is one way we make a “protein shake” without protein powder. Seeds: An easy way to get some seeds, is to make them into a spread like we did Friday with the Sunbutter! Add this to sandwiches or fruit and voila, delicious protein! Cottage Cheese: Cottage cheese and fruit can be a kids favorite if you start them young. We love cottage cheese mixed with in-season fruit. We also like blending cottage cheese to make pancakes, like this recipe for a high protein pancake. Lunch Meats: We roll a small slice of turkey around a carrot stick or pretzel rod. 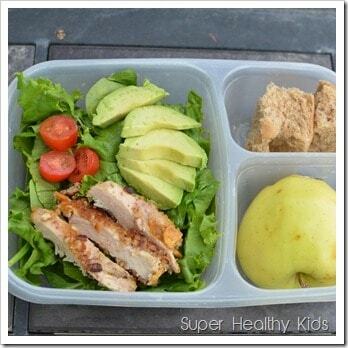 This easy to pick up lunch or snack is simple and requires no knives! Also we stack meats, cheese, or veggies between two whole-grain crackers. You can stack these separately and let the children assemble their own sandwiches. By deli meats, we mean thinly sliced cuts of meat! Traditional deli meat is packaged with nitrites, which you can avoid by finding a farmer that will process the meat without them. Beans over rice with some melted cheese on top is perfect for a complete protein. Plus, the melted cheese always makes things tastier. Meat Alternatives: Although we actually don’t use these much, meat alternatives can be an occasional treat to make a traditional favorite a bit healthier. 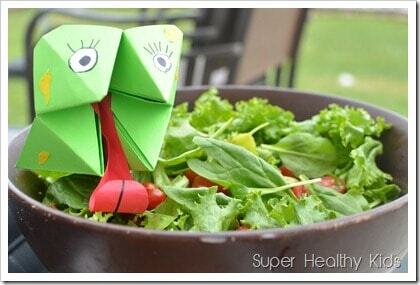 “Pigs in a blanket” can be healthy if you wrap a veggie breakfast link in a crescent roll. Bake until the roll is browned and cooked. Ground Beef or Turkey: We like to replace ground beef with ground turkey because it takes on a new flavor, but both are great sources of protein! We enjoy ground turkey burgers, ground turkey spaghetti, or even ground turkey tacos. Chicken!! 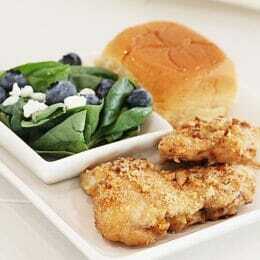 This is where our recipe of the day comes in, Crusty Pecan Chicken! 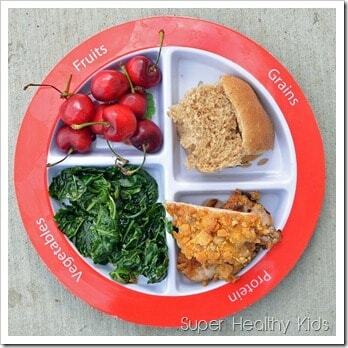 I like this one because both the pecans and the chicken are good sources of protein for kids. 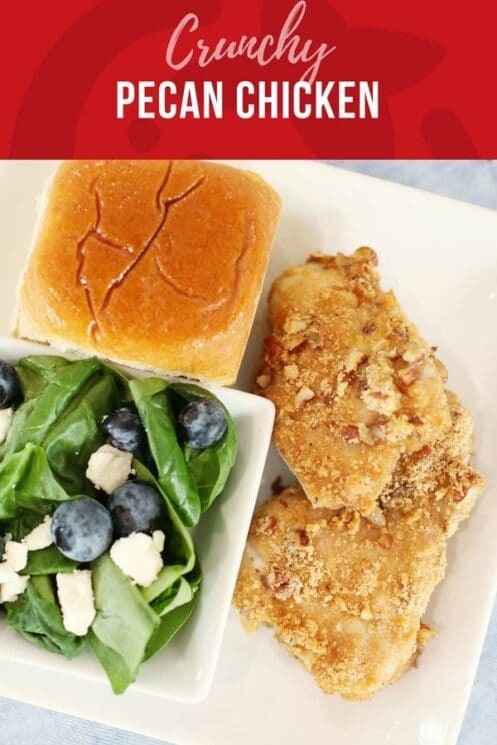 This pecan chicken dish came as a surprising favorite for my family! In fact, I had no intention of blogging about it, or else I would have taken ‘step by step’ pictures along the way. 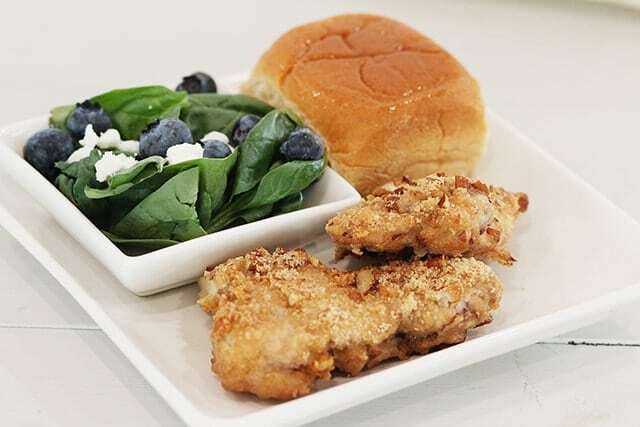 This Crunchy Pecan Chicken combines pecans and crackers for the crust to make it extra crunchy on the outside, with a hint of nutmeg for some flavor. Plus, it was super easy! The best part about this chicken? The leftovers!! The next day, add it to green salad for lunch! Preheat the oven to 375 degrees F. Grease a baking sheet with nonstick cooking spray. Pound chicken to slightly flatten; sprinkle with salt and pepper. In shallow dish beat egg. In second dish combine pecans, crackers, and nutmeg. Dip chicken in egg then nut mixture, pressing to coat. Place chicken on the prepared baking sheet. Drizzle with the olive oil. Bake for 25-30 minutes or until golden brown and the chicken is baked through. 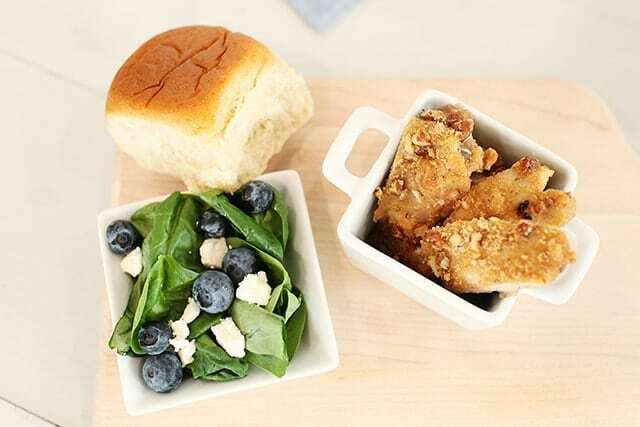 Serve with dinner rolls and a spinach, blueberry and feta salad; drizzled with dressing of choice. I am disappointed to see deli meats on this list, as they are far from a healthy food, what with salt and nitrites, a known carcinogen. It’s possible to get deli meat without salt and nitrites. We buy ours from Christiansens Farm in Utah, a local farmer who cuts their meat and packages it without them! It just takes a little searching and you really can get some delicious alternatives! Hi again Amy, thanks for your comment. I wasn’t aware that that was even a possibility. Recently, I discovered that Schneiders Country Naturals and Maple Leaf Natural deli meats are, in fact, not natural at all. “Cultured celery extract” is the fancy term they use for nitrites. Have a great day and I agree that perhaps the organic farm is the best place to go. I’m very interested in this chicken recipe but I hate cooking with chicken thighs. I find they take a long time to prep….to cut all the fat away and I’m not really a fan of the meat itself. I suspect this recipe would be equally as good with chicken breast so will try it this week! Thanks for the post! Amy, I found some “deli” meat at Costco that is nitrite free- it is the Kirkland sliced roasted turkey breast. There are two flavors, oven roasted and honey roasted… I love them both. The only downside is they only last a week or so since there are no preservatives. I’m sure they’ll be great with chicken breasts! Even I would try chicken tenders next time! Some store sell boneless, skinless chicken thighs. They are great to use instead of chicken breasts. Chicken thighs have more nutrients (and more saturated fat) than chicken breasts. Hi, Amy! I tried this recipe with my family and they loved it. Not a small feat for my picky eaters, let me tell you! We’re trying to cut back on our red meat consumption, and I’ve been looking for inexpensive yet flavorful meals using chicken and fish. This one is definitely a keeper! Thanks for sharing! For those commenting about the deli meats – please get out of that processed store bought pre-made concept… If you have a few extra minutes to a little prep work, take a plain, (not already seasoned) fresh boneless turkey breast/roast, season to your liking w/ fresh or dried herbs, bake it yourself then slice thinly with a knife. For those that can afford it and have access – we have a store called Harbor Freight that sells an inexpensive, smaller version of a deli slicer (its about 30 bucks) and we make our own homemade “deli” meats. It works out great for us, less fat and less sodium. I think it just tastes so much fresher as well!! What dressing do you recommend for a salad with fruit? Kids are different! We love creamy poppyseed dressing or ranch!